With this the amount of exercise and physical activity has severely decreased for many children. It is estimated that of every 3 children in America that 1 of them is overweight. A recent study conducted in 2010 stated that it is not the amount of television that the child watches but rather the number of junk food commercials they see during that time period that increase the risk of childhood obesity. The study showed that children who watch television with junk food commercials were more likely to be overweight than children who watched other forms of television such as DVD’s without commercials. Advertisers purchase commercial air time on specific television shows to impact specific audiences. Adult television shows target adults with cars and appliances for example. Children’s television shows target children. During these slots you will see commercials for toys, games and foods such as snack foods or fast foods. For every 30 minutes of television your child will view approximately 8 minutes of brightly colored commercials with catchy jingles that will stay in their heads prompting them to want junk food instead of healthy nutritious snacks and meals. The American Academy of Pediatrics (AAP) suggests limiting the amount of time a child watches television to 2 hours per day. 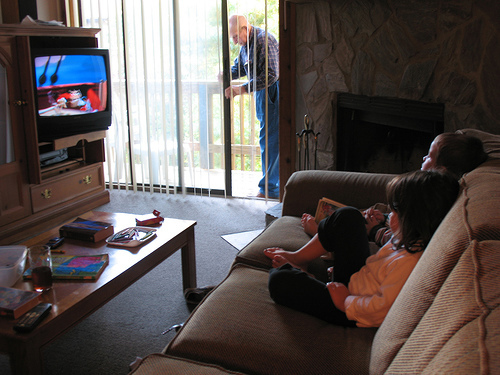 Children are inactive while watching television and most watch more than 2 hours of television per day. Besides being sedentary while watching the TV they often snack on unhealthy foods while doing so. Both of these facts can lead to weight gain and childhood obesity. You can encourage your child toward physical activity by limiting the amount of time they spend in front of a television and replacing the extra time with physical activity for you and your child. You can also help by making the time they do watch television commercial free. This can be accomplished by watching movies on DVD or by recording the shows and teaching your child to fast forward through the commercials. If the commercials cannot be avoided, spend the time with your child and mute the commercials, engaging your child in conversation during the commercial. You can also keep healthy snack food choices in the home for television time or do not allow foods and beverages in the room where the television is to keep your child from mindless snacking while viewing television. Do Sit Ups Damage Your Back?